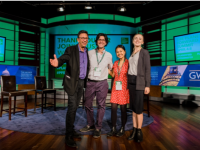 When the Earth Institute and the School of Professional Studies launched a brand-new Master of Science in Sustainability Science program in Spring 2018, the program introduced several exciting new courses. Climate Science for Decision Makers: Modeling, Analysis, and Applications is taught by Michela Biasutti, Michael Previdi and Yutian Wu. Biasutti received her Ph.D. in Atmospheric Sciences from the University of Washington. In 2004 she joined the Lamont-Doherty Earth Observatory of Columbia University where she is now an associate research professor. Her research interests focus on the variability of rainfall in the tropics, from the fast development of weather systems to the dynamics of long-term droughts and pluvials associated with man-made and geological climate changes. Previdi received his Ph.D. in Environmental Science from Rutgers University. His post-doctoral work included studying the effects of North Atlantic Oscillation variability on the air-sea exchange of CO2 and response of the global hydrological cycle to different anthropogenic forcings. Previdi became a Lamont assistant professor in 2010, and an associate research professor in 2015. His latest research has focused on the causes of Arctic amplification in climate models and observations. Wu received her Ph.D. in Applied Mathematics from Columbia University in 2011. She is now an assistant research professor at Lamont-Doherty Earth Observatory where she researches the general circulation of the atmosphere, including the mid-latitude jet streams, storm tracks and monsoon circulation. Her recent research projects focus on understanding the impact of Arctic sea ice loss on the mid-latitude weather and climate as well as understanding the summer monsoon circulation and its associated troposphere-stratosphere transport. Biasutti, Previdi and Wu brought together their diversity of climate science experience this semester to offer the new course addressing the underpinnings, analysis and applications of climate modeling. The teaching team notes the importance for sustainability professionals to have these skills in their toolkits, explaining that in the face of currently observable and rapid climate change, designing and implementing sustainable practices requires knowledge of climate variability and predictions of climate change. Most of this climate information comes from numerical models of the Earth system that are exceedingly complex. Understanding the range of climate risks, the most probable future and the chances of unexpected surprises requires that one understand the way in which climate models are built and the assumptions that underpin them. The team identified several recent trends in the field that the course draws upon, giving students a window into cutting-edge modeling developments. There has been increased focus in recent years on climate extremes (e.g., floods, droughts, heat waves), given their substantial impact on society. Additionally, significant research effort is presently being devoted to developing a better understanding of the dynamics of continental ice sheets (Greenland and Antarctica), given the potential for ice sheet dynamical processes to produce large and rapid global sea-level rise. Finally, increases in computer power and the accumulation of new observations from previously inaccessible corners of the globe have allowed scientists to create physics-based numerical models that are more comprehensive in their representation of Earth (e.g., including dynamic ice sheets), or more detailed (e.g., resolving the structure of hurricanes or tight meanders in the Gulf Stream). The class provides a survey of these latest trends in modeling capabilities that are the source of new discoveries and refined projections. Biasutti, Previdi, and Wu say the climate system is truly fascinating and complex, and even though our understanding of it continues to increase rapidly, many important questions remain unanswered. 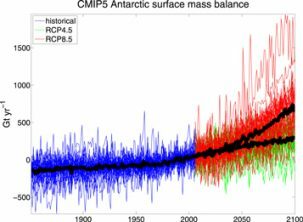 Additionally, the numerical models that simulate the climate system are in a state of constant flux, representing a larger number and more sophisticated physical processes as the models are continuously developed and improved. The teaching team finds that all of this makes climate science an extremely exciting and up-and-coming field and has worked hard to impart this enthusiasm on their students during the semester through hands-on learning opportunities, including labs and self-selected final project topics. Understanding the range of climate risks, the most probable future and the chances of unexpected surprises, requires that one understand the way in which climate models are built and the assumptions that underpin them. Students in the course first gain a foundation of the dynamics of the physical climate system that underpin climate models and come to understand what aspects of the system are well observed and understood, and where quantitative uncertainties remain. The course delves into tangible skills to visualize, analyze, validate, and interpret climate model outputs. Students develop the ability to assess the reliability of public impact projections and to build and customize their own projections. With these skills students will be prepared to estimate climate hazards in their own fields, accelerating the design and implementation of climate-smart, sustainable practices. The M.S. 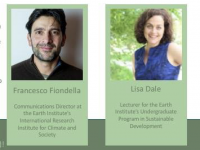 in Sustainability Science, co-sponsored by the Earth Institute and Columbia’s School of Professional Studies, focuses on the scientific methods and tools that can be used to observe, monitor, and respond to environmental impacts. Visit our website to learn more.